Perhaps it is my background – working in the financial sector makes a girl yearn for glencheck and houndstooth patterns, especially when considering her fall wardrobe, even though it is DEFINITELY still summer. Black and white checks are huge this season, but the really great news is that classic patterns never go out of style. British Vogue just profiled this outfit from Marks & Spencer…Yes, I did just use British Vogue AND Marks & Spencer in a sentence! M&S sweater and pants are each priced at a modest $54.85! Click the blue, buy them and have them shipped across the pond! 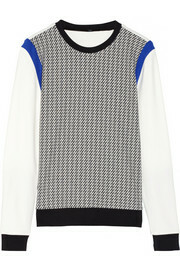 Net-a-Porter has some fab options such as this fun TIBI sweatshirt. FYI the word sweatshirt has been altered this season, think style piece not ripped old grey thing put on when needing comfy clothes! 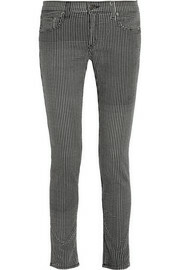 Rag & Bone’s velvet houndstooth jeans are divine! Click here to get happy! This entry was posted in Boston fashion, Boston suburb fashion, Fall Fashion Trends, Fashion, Magazines, Media, Shoes, Shopping, Technology, Travel, Trending, Trends, Uncategorized and tagged banking, British Vogue, Celine, Chanel, DVF, fall fashion, Financial sector, glencheck, houndstooth, Lucky, luckymag, Marks & Spencer, mohair, patterns, Rag & Bone, TIBI, tweed, UK by reversecommuter. Bookmark the permalink. You look chic and gorgeous, love the pieced you selected too! you look casual and glamorous.. nice outfit..